These little peppermint shortbread cookies are just 6 ingredients and little moist bites of Christmas heaven! The perfect cookie for a cookie exchange, or to brighten up a treat plate! You can make this dough ahead and store in refrigerator so it's ready to slice and bake! Perfect to keep handy for last minute needs during the holiday season when you need to show up with festive treats! I'm using my 3 great sponsors in this recipe! : Adams Extracts and Colors: Pure Peppermint Extract, as well as their food colors which are free from artificial dyes! 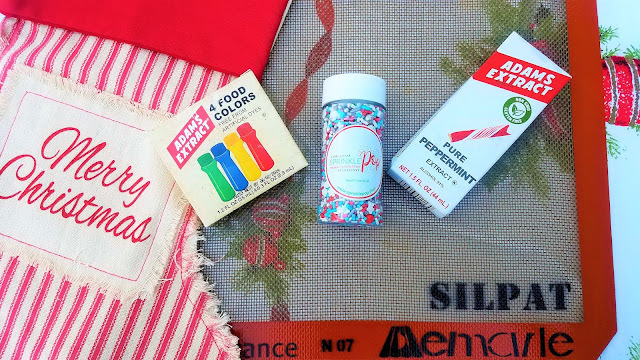 I'm also using Sprinkle Pop's adorable little candy sprinkles in the shape of candy canes! they are so cute! and I couldn't get through my holiday baking without this great Silpat silicone baking mat. (and that it comes with a ring that helps it stay rolled up when I'm done?.. oh yea). Use a pastry blender to cut in butter. You want to work it till it is very fine crumbs. Stir in extract, food coloring, and peppermint crunch chips. Place dough on counter and with your hands to knead the dough until it comes together and forms a ball. Line a baking sheet with silicone baking mat or parchment paper baking sheets. Cut slices of cookie dough about ¼ inch thick and place on baking sheet. Bake for 10-12 minutes or just until cookies are set. Do not over bake. Let cool for several minutes on baking sheet before removing to cooling rack. Let cool completely. These have such a beautiful color and I love the candy cane sprinkles! These are such a beautiful color and I bet they smell wonderful! 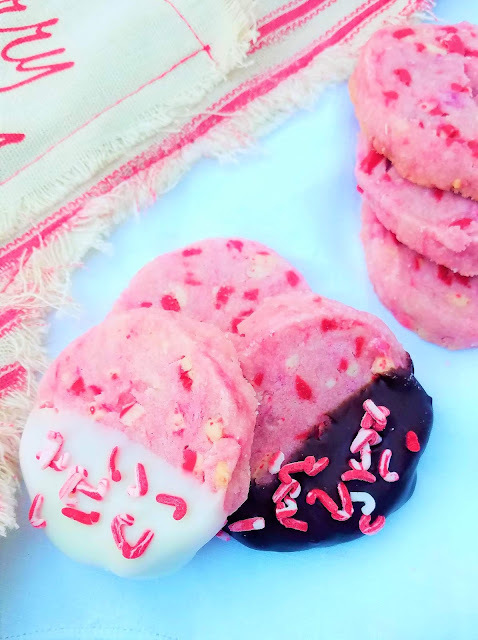 I love a holiday peppermint cookie and dipping it just makes it that much better! Gotta try these! Love that you made two kinds!! Mmmm...do these every look tasty...especially the ones in milk chocolate! They sound heavenly! Those candy cane sprinkles are super cute!! And these cookies look so scrumptious. I love the chocolate and peppermint combination. This is a great recipe to make and freeze to have at the ready when unexpected guests pop by! love the color on the cookies. Actually you had me at peppermint! What pretty cookies and they look delicious too! 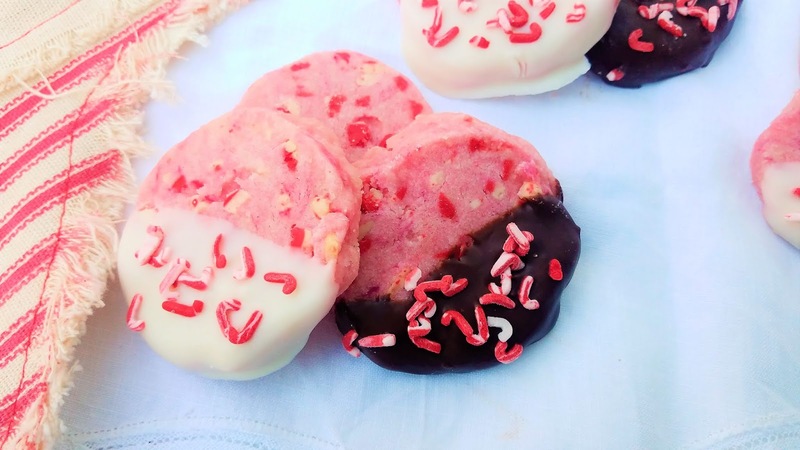 These peppermint cookies look perfect for the holidays! Love that you dipped them in both white and milk chocolate, yum! I think my kids would love these cookies. 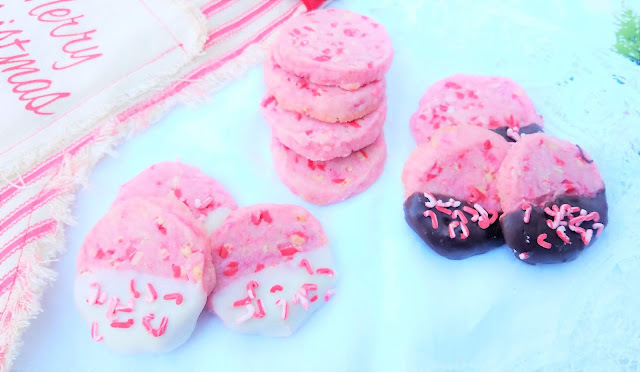 Such pretty and fun cookies. I love the bright color, dark chocolate dipping, and cute little festive sprinkles. I have a holiday party coming up... I may very well add these to the menu!